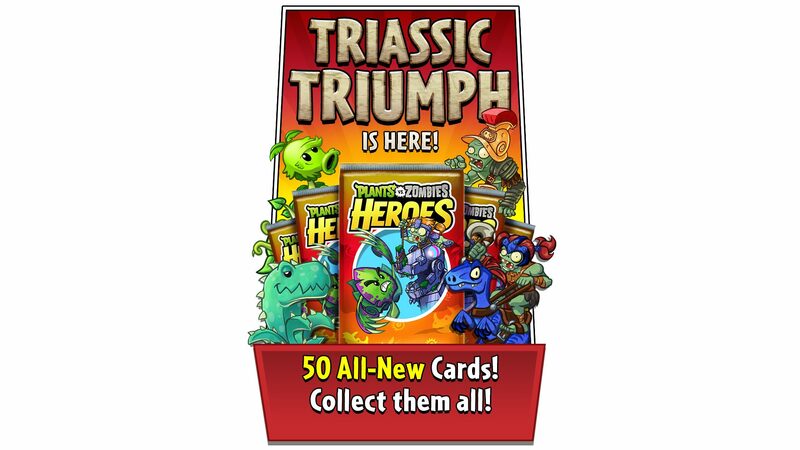 Triassic Triumph brings 50 triumphant new cards in a new pack! Triassic Triumph brings 50 triumphant new cards in a new pack! After Hollow Earth was discovered in Colossal Fossils, Neptuna did not leave paradise lost. Instead, she has flooded Hollow Earth with new oceans, attacking with a vast army of Zombie explorers, pirates, and barbers. Gigantic new Zombie and Plant dinosaurs crash together at the height of the conflict, pitting robotics against radishes. Plants and Zombies evolve into new forms to meet the threat, from a very grumpy pile of spinach to Zombies with dogs, whales, goats, and monkeys. Driving back the Plant Heroes, Neptuna's 'Triassic Invasion' seeks to find and align all the long-whispered Mustache Monuments...before time runs out! Go to the store to buy Triassic Triumph packs now! 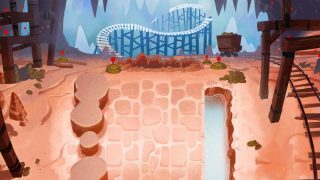 In Triassic Triumph, you'll find 10 different 'Fusion' Plants and Zombies, like Pumpkin Shell and Killer Whale. You can play one in an empty lane and it will fight as normal. You can then play another Plant or Zombie on top of the Fusion card, 'fusing' them together to unleash special abilities! Just like you can play Evolution Plants on top of something else, you can play something else on top of a Fusion Plant. It's like Evolution flipped upside-down! Triassic Triumph is the sequel to Colossal Fossils. So here you'll find 15 new cards bringing back Colossal Fossils' keyword abilities in new ways. There are 6 new Dinosaurs with Dino-Roar abilities, 7 new Evolution cards, and 2 new Untrickable cards. We believe the game is most fun when a large variety of creative strategies have great chances to win. We love having lots of powerful cards that do different things well. That said, when some cards are too powerful, those strategies can show up too often, be too hard to beat, and end up too annoying. Accordingly, based on card win rate data and player feedback, we've made some card balance updates to help keep the Classes, Heroes, and strategies varied and well-balanced. We've taken a bolder hand than usual this time, moving several cards' power levels up and down to get the Classes to the right place. Any cards that got weaker have their Recycle values temporarily increased to match their Crafting costs, so you can recycle a changed card for something else of the same rarity if you wish. Gargantuar-Throwing Imp is now stronger: it says 'When hurt: Make a random Gargantuar that costs 5 in a random lane.' instead of always making Smashing Gargantuars. Zom-Blob no longer has Bullseye. Medulla Nebula, now gives 2 brains when you play Zombies there instead of 3. Leprechaun Imp now shuffles 1 Pot of Gold into your deck instead of 2. Escape through Time now costs 2 brains instead of 1. Zombie King now does not re-knight existing Knights of the Living Dead. Zombot Aerostatic Gondola We fixed a bug where its text had accidentally said 'When this does damage...' Now its text correctly says 'When this hurts the Plant Hero...', matching its game effect. (Sorry about that text bug!) Its Recycle value has been temporarily raised to match its Crafting cost. Sow Magic Beansno longer draws a card when you play it. Untrickable now consistently makes a card unaffected by all your opponent's tricks. For example, Untrickable cards are now correctly undamaged by your opponent's Cherry Bomb, Lava Guava's initial damage, Precision Blast, Power Pummel, and Wall-Nut Bowling. Witch's Familiar, Immorticia's signature superpower, can now correctly be played on the Water as well as the land. It's now physically easier to play Evolution Plants on Team-Up Plants without the Plant moving out of the way. We also fixed a lot of smaller bugs. Thanks for your patience with those bugs! An Evolution card played on another card now shows a special Evolution glow. Several keyword ability icons on cards (like 'Armored') now show a special animation on those icons when that card is played. Thanks for all your support and enjoy TRIASSIC TRIUMPH!